From the main menu, access the "Bonus Features" option and click on the tour of the ships. Select the treasure hunt and find all eight sphere with no mistakes. Don't press anything and a multi language video clip will play the song 'I'm Still Here' in several different languages. From the main menu, access the "Bonus Features" and go onto the ships tour and select 'Treasure Hunt'. 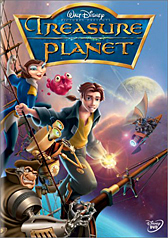 If you successfully uncover all eight spheres you get a deleted scene featuring an alternate meeting between Jim and Billy bones. From the main menu access the Setup Menu . Highlight 'Captions', '"Spoken Languages"', or the 'THX Logo' and press your Right button. A hidden 'clapboard' will be revealed. Select it to uncover some hidden DVD credits.